This is a really cool book for kids that explains the origin of all living things. It’s chock full of wonderful illustrations, and explains evolution in plain terms, while giving lots of easy-to-understand examples. It talks about the science of geology and how scientists have come to the conclusions they have, and how science is always expanding and looking for more answers to questions of how the earth and humankind came to be. I was drawn to buy this book after seeing it somewhere on the internet (wish I could remember where …), as I’ve been hit up, like most parents, with questions from my kids about how the earth came to be, where did animals come from, and where did people come from. 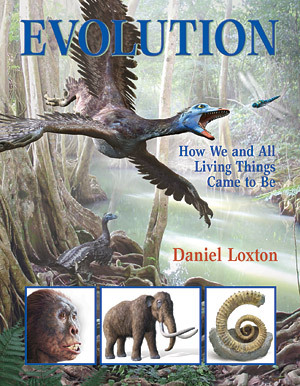 I am a believer in evolution and definitely not a fan of filling my kids’ heads with fantastic fables and fairy tales about our origins, and this book seemed, at first glance, to fit the bill for explaining evolution to kids in straightforward terms. When it came in the mail from Amazon, I sat down and read it cover to cover and was very impressed. I was especially curious about what, if anything, it would have to say about god. It contains a brief paragraph in which it treats religion very diplomatically, saying that while individual scientists may have their own personal views about religion, science as a whole does not pertain to or address religion, and spiritual matters are best taken up with parents and community leaders. My kids (the ones ranging in age from 5 to almost 10) are completely fascinated by this book!